As the second of nine children, she looked after her younger brothers and sisters until she went away to boarding school. There, she blossomed and was elected to be a school delegate. She believes this early sense of responsibility had a positive impact on her professional life. 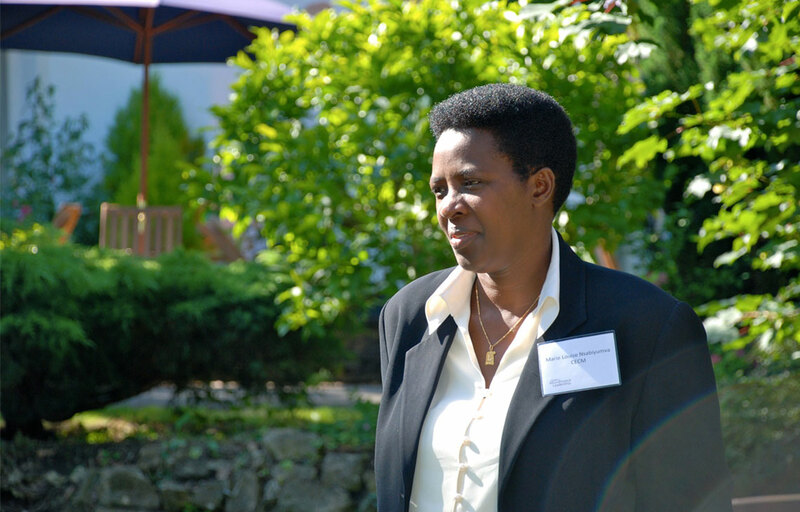 Marie Louise’s interest in women’s issues was inspired by an aunt who campaigned for women’s rights, became one of Burundi’s first female ministers and, eventually, the head of the Ministry of Social Affairs and Promotion of Women. She was inspired by her aunt’s stories about the women’s advancement. “My aunt and her team were able to achieve certain rights for Burundian women at the UN Conference on Women in Beijing,” she says. Marie Louise became involved with microfinance while working as a local representative for a Canadian nongovernmental organization (NGO) operating in Burundi. Given a political crisis that shook the country at the time, donors willing to fund financial services for low-income women were rare, but the NGO helped to create a local savings and credit cooperative authorized to collect funds. After what she describes as “some paperwork,” Marie Louise was appointed to start the operations and Caisse Coopérative d’Epargne et de Crédit Mutuel (CECM) was born. As a women leader, Marie Louise believes she has a responsibility to voice concerns of other women. In her view, many women have good ideas but no opportunities to make them known. At the start, CECM was known simply as the bank for women. Marie Louise clearly remembers when she saw the very first 20 women come to entrust their meager savings to CECM and when deposits at the institution reached a collective total of US $1 million. However, during its 20 years of operation, CECM has been at the mercy of Burundi’s volatile politics. Donors were forced to suspend funding due to political disturbances before CECM began to generate revenues. Marie Louise remembers watching helplessly as political groups burned the Great Market in the capital Bujumbura while women clients burst into tears on seeing their goods destroyed. Nonetheless, the success of small enterprises initiated by women and funded by the CECM gives her happiness and always has. Marie Louise loves accompanying a woman on the journey of starting a small shop on a table in the market and watching her business grow to a level where she has to procure stock internationally from places such as Dubai. That brings her a “joy and satisfaction” that is hard to describe. Allegra Palmer is the associate on the Knowledge and Communications team at Women’s World Banking. She has been with the organization since 2012, planning and executing programmatic events such as conferences, workshops, trainings and exchanges.